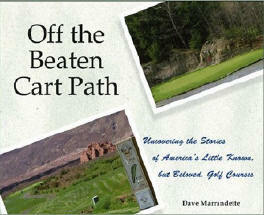 Dave Marrandette doesn’t need a lot to indulge in what appears to be a profound dual addiction to golf and wanderlust. All he requires is an RV, a detailed Rand McNally® road map for every state in the Union, and a good pair of eyes, capable of picking out tiny entrance signs for out-of-the-way golf courses. Fortunately for the rest of us, Marrandette is well equipped, as he shows in his newest book, Off the Beaten Cart Path, (Wiley; $18.95 SRP). Marrandette details some of the highlights of a meandering six-month ride through the United States, playing the municipal and small-owner layouts that dot the nation’s landscape. At times in the narrative, the book reminded me of William Least Heat-Moon’s famous bestseller, Blue Highways. As with that writer, Marrandette seems to have a decided preference for the old highways and byways. In addition, in both cases the point was not so much the miles traveled, as what would be experienced during the journey. And what experiences! Marrandette plays Sky Mountain Golf Course in southwest Utah, home of some of the most amazing mountain views in the country. He stares at a par-3 hole in upstate New York, whose players are challenged by the stone quarry surrounding the green, a memorial to the former use of the property. An alkali flat sitting in Wyoming at 6,800 feet above sea level becomes a golfing jewel, thanks to a generous local donor and a willing small town with only 10,000 lucky inhabitants. A trip south of Tucson, Arizona leads to a golf course featuring two of the state’s hardest par 3s, as well as movie memorabilia from when it was used as the location for a memorable scene in Kevin Costner’s Tin Cup. Marrandette writes that he was searching for evidence of the true spirit of the game, and found many heartwarming examples that he shares with his usual enthusiasm. For example, he meets a 97-year-old golfer who’d been a fixture at the Suwannee Country Club in Live Oak, Florida for well more than 50 years. She is also the proud record holder of two holes-in-one there, shot when she was a mere 83 and 84 respectively. The same golf course features a tribute to an enterprising long-time player, who once “borrowed” a bucket truck from Florida Power & Light to clear an opening in the trees on a difficult but short par 4. That kind of initiative would be appreciated at many other golf courses, I expect. ’I did it solely for the love of the game…. I had been playing golf all my life and thought it would be fun to own and operate my own course.’ And yes, he did realize that owning and operating a golf course was a 24-7 job….Today Great Oaks is his own ongoing work of art, constantly being tended to and refined. There are over 15,000 golf courses in the United States. For obvious reasons most folks tend to focus on a few dozen of them, home to PGA Tour events and the occasional USGA major. Those are all fine, beautiful golf courses, but the vast majority of American golfers never step foot on those greens. 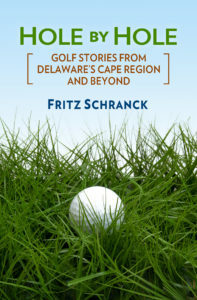 Instead, most of these 25 million or so golfers play their games on the kinds of courses Marrandette memorializes in this charming little book. As he found, there’s a lot to like about these places, as well as the folks who play them. The real spirit of the game can be found there, and he did. This year we’ll be covering Pete Oakley’s tournament play on the PGA Champions Tour and on the European Senior Tour. The Director of Golf for The Rookery Golf Course near Milton played in the Champions Tour’s season opening MasterCard Championship at Hualalai, Hawaii, January 19-21. He finished tied for 38th with a 3-under par 213, earning $9,750 and beating the Wadkins brothers, Bobby and Lanny. On January 22 he missed qualifying for this week’s Turtle Bay Championship by 2 strokes, just missing one of the nine openings made available under the new Tour rules for the 2007 season.